Sherry Simpson is the author of two essay collections, The Accidental Explorer and the Chinook Award winning The Way Winter Comes. Her work has appeared in numerous anthologies, including On Nature: Great Writers on the Great Outdoors, In Fact, Going Alone: Women's Adventures in the Wild. 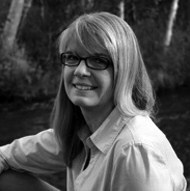 Her acclaimed writing has also been featured in several journals including Creative Nonfiction, The Alaska Quarterly Review, Pilgrimage, Brevity, and Orion. She teaches creative nonfiction for the University of Alaska Anchorage's MFA program and Pacific Lutheran University's Rainier Writing Workshop. The black bear made no sound as it walked up behind me, and only later did I remember that old name for bears, Lightfoot. Perhaps I wasn't listening carefully enough. My mind had fixed on the ruddy morning light washing over the cliffs beyond the Chitistone River. I was bent over a notebook, sketching the abraded peaks rising above the young forest of birch trees. Leaves quickened in the breeze, the faintest yellow semaphoring the end of summer. In the distance, the river was a hank of rope endlessly fraying across a broad plain cobbled with rocks and patched with mats of mountain avens. Behind me, thin smoke twined from the woodstove's chimney. A tin can of a plane had left me here in the Wrangell Mountains, and I'd spent my first night out on the river bars huddled beneath a tarp, hoping the gray drizzle would disappear, hoping the couple occupying the public cabin up in the woods would disappear soon, too. Both wishes had come to pass. No sound, no smell, not even sight alerted me to the shadowy presence beside me. Some vibration at the edge of awareness made me look up. Three feet away, just beyond reach of an outstretched arm, stood a black bear. It was Lightfoot. It was Black Place, Dark Thing, Medve. It was Bluetail, it was Broad-foot, it was the Dog of God. Curious, how Grandfather (or was it Grandmother?) stood so quietly, so solidly, as if he (or she) had emerged from the very earth. The bear did not look at me. It faced the same direction as I did, and it is only my fancy now that it was wondering what was so darned interesting about those mountains. For that one moment, I wasn't afraid. I wasn't even human. For that one moment, anything was possible. It was, after all, only a moment. I leaped to my feet and shouted, "Hey, you!" The bear seemed equally startled to realize I was there. It scrambled a few yards away and then paused when I blew on the whistle. "Go away!" I shouted. It had shining black fur and a smooth tan snout, and it weighed maybe a couple of hundred pounds, if that. Hollers and whistles didn't worry this bear, but it would be wrong to say it regarded me with a calculating air. I blasted away with a small air horn as I grabbed my gear and marched toward the cabin door. The bear loped into the dark spruce forest. Inside, I felt safe, then shaky. A few years before, my husband and I had faced an antagonistic brown bear in Glacier Bay with nothing more lethal than our voices. For this trip, I'd brought the air horn, a whistle, and a can of pepper spray. The .357 revolver was my solution for any aggressive man who happened along, but it's also true that when I imagined a bear breaking into the cabin, I didn't imagine blowing a whistle to stop it. Now, every story I'd ever heard or read about disturbing incidents between black bears and people surfaced unbidden in a brain that has a hard time recalling its own phone number. I didn't want to overreact, nor did I want to be careless, but it's hard to tell yourself that you are exaggerating your fears when you look up to see your fear standing beside you, all in glossy black. The next morning, I opened the door and caught the bear in mid-step a few yards away. Yelling, blowing the whistle, banging on a pot—nothing I did bothered the bear. It watched as if I were an animated monkey plonking its tinny cymbals. The bear left only after I heaved a rock that miraculously banged against a slab of rusted metal near its head. I couldn't shake the sense that it was sneaking up on me, stalking me. Ninety minutes later, as I sat inside worrying about how unbearish this bear seemed, I heard something scratching and rubbing against the back wall, and then, the electrifying sound of snuffling around the door. I pressed the air horn against the hole made by the latchstring, and the blast sent the bear leaping off the porch and galloping into the woods, paws thudding against the earth. Now the canister was empty. I stepped onto the porch and fired the revolver into the air for emphasis. A fire-alarm clanged in my head for awhile, reminding me about a friend deafened in one ear after target-shooting without earplugs. At least, I thought, that bear knows I mean business. That evening, it wandered past the window as nonchalantly as a cow. I inventoried my arsenal: one fire extinguisher, three cans of pepper spray (two already in the cabin), a revolver and box of bullets, my opposable thumb. I cooked indoors and dumped leftovers and dishwater into the outhouse pit, hoping to disguise the scent of food. Whenever I ventured into the outhouse, I clutched the gun in one hand and the pepper spray in the other. This made using toilet paper awkward, but it was too appalling to contemplate the possibility of being mauled with my pants around my ankles. "We told her not to go by herself," my friends would say. In the mornings I left for the naked expanse of the river bars, singing my way out of the trees. The days eroded as I wandered across the cobbled plains, reading and sketching and thinking and not-thinking. Fleets of orange-and-olive grasshoppers skipped ahead of my feet. A couple nibbled on my ankle experimentally as I lounged against a driftwood log; one paraded around with me as if pinned to my breast like a broach. I returned the gesture by rescuing its comrades from river eddies. All around lay stones that ice and water had busted into puzzle pieces, or unfolded like daisies, or sliced like sausage. Fox tracks led me along the river, and the fading prints of a smallish bear and her cub evaporated into air. A magpie dropped by to see if I was dead yet. Playing the role of deux ex machina, I assisted an ant dragging a grasshopper leg across a rockfield. Channeling Clint Eastwood, I gunned down innocent rocks perched on logs. Often I paused to scan open terrain suspiciously. "Now I know what an impala feels like," I wrote in my notebook. Fear would trap me in the cabin, not the bear. I hiked up Glacier Creek toward the Twoharpies peaks, thrashing through alders and hollering songs that even the bears must have grown weary of hearing. By now, I'd pieced together a familiar course of events between human and bear. Visitors with a keen sense of irony had scribbled notes of bear sightings earlier in the summer on a brochure titled "Safety in Bear Country." Mama & cub came by for a sniff. Teen-age black bear checked us out while we ate dinner on the porch. Bear peeked in the window. Black bear was seen—he loves beer. He took off with some. Prospectors had posted a warning in the airstrip shed that described a bold, young black bear that had picked through their stored food the previous summer: "He is not frightened away, only deterred by yelling & rocks." This was the kind of bear I feared most: a young animal that did not fear people, that connected humans with free chow and cheap beer, that maybe was one of those rare black bears that biologists call "predatory. "One night I dreamed the bear stood beside my bunk. The evening before the plane would arrive, I sat by the cabin window playing Solitaire with an incomplete pack of Uno cards someone had left behind. The bear paced up the river path. The deliberate way it placed its paws against the earth explained how it had appeared behind me so noiselessly. It wasn't sneaky or surreptitious. That's just the way a bear moves through the world. I stared at its face, trying to see some intent in its eyes, but the bear did not look up. It walked around the cabin and climbed onto the porch to sniff at the door. "Hey," I protested half-heartedly. No sense bothering with the gun or the whistle. In the morning, I'd be gone. Sometimes I wonder what would have happened had surprise and fear not driven me to my feet, had I waited to see what that black bear wanted, if anything, as it stood beside me. It's a moment I return to again and again, a moment elastic with every possibility, each one snapped as soon as I stood and yelled. When I think of that bear—that bold pest, that creature of unruly appetites, that beautiful Lightfoot—the moment reaches into the long, long history between people and bears, recalling ancient reversals in which we are each sometimes predator and sometimes prey, sometimes sacrifice and sometimes revenant, sometimes noble and sometimes benighted, and again I see how that bear taught me less about what it means to be a bear, and more about all the fearful, hopeful ways in which I am so helplessly human.